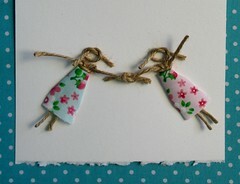 On Saturday, I was playing with some bits of jute twine snippings and out of that came these string girls. The first one was actually Sun girl because I started by making the sun and then I was experimenting with knotting the leftover bits of twine. It was quite an organic process as I just followed what the medium told me and suddenly, a form appeared. My creative method sometimes starts with a fully formed idea in my mind, which I then attempt execute. This can be a frustrating method when I can't achieve what I saw in my mind's eye, but it can also be very satisfying to conceive a vision, then make it reality. But there's a certain joy to the magic of just playing with things and letting one thing lead to the next. You end up with this sense of natural creation.... that it was meant to be that way. Did you notice the pink tulips on the Sun Girl card? Those were a bit of the Petits Gateaux box. These cards are difficult to photograph because of their three-dimensional nature. I've left the arms, legs, and pigtails free, so they have a lovely sense of movement in person... like they're reaching off the card. These are absolutely gorgeous, I love them!